Chaat is Indian street food. Popular across the length and breadth of India, Chaat has made inroads into Oak Tree Road restaurants in Edison and Iselin. Favorite Indian Chaats include Sev Puri, Samosa Chaat, Aloo Puri, Dahi batata Puri, Bhel Puri, Pani Puri, Palak Chaat and Chinese Bhel. Chaat is prepared with a combination of fried chickpeas flour snacks like sev, small puri, papdi, raw chopped onions, boiled chickpeas, chopped fresh cilantro leaves, tamarind, hot chilli garlic, date fruit sauces and fresh yogurt. Besides the mainstream Indian restaurants, there are some exclusive Chaat joints on Oak Tree Road that peddle a variety of Chaats and other Indian street. 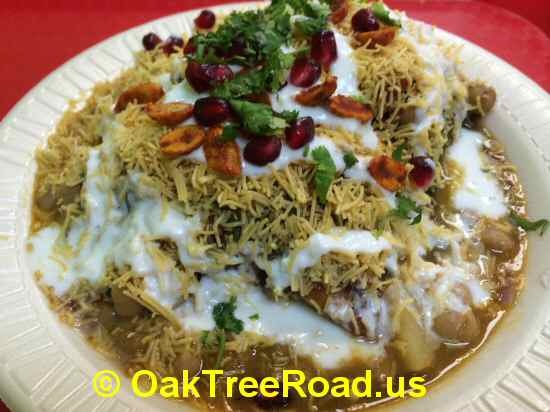 Desi Galaxy in Sugartree Plaza, Chatkaz in Flavor Junction and Indian mithai and sweets stores like Rajbhog are some of the joints on Oak Tree Road that offer Chaats in a big way. Besides Chaat joints, Oak Tree Road Indian grocery stores like Apna Bazaar, Patel Brothers also offer ready to eat Bhel Puri, Alu Batata Puri Chaat packets from Haldiram, Swad and Bansi brands either with dry spice powders or with chutneys.